Wuhan (武汉; Wǔhàn) is the capital of Hubei Province in China and a major port on the Yangtse River. Memorial Hall of 1911 Wuchang Uprising, Where Sun Yat-Sen Issued his Edict to Overthrow the Qing. Wuhan once consisted of three separate cities; Hanyang, Hankou, and Wuchang. Hanyang was a busy port as long as 3,000 years ago in the Han Dynasty. Yellow Crane Tower was first built in 223BCE and gained fame throughout China through the poetry of Cui Hao during the Tang Dynasty. Wuchang has been a center of learning for centuries, especially in the field of the arts. It became a provincial capital in the Yuan Dynasty. Hankou was considered to be one of China's top four cities during the Ming and Qing Dynasties. It was the busiest inland port, first opened as a treaty port in 1661. During the 19th century, as a result of concessions granted in the aftermath of the Opium Wars, large areas of Hankou's riverfront were carved up into foreign mercantile divisions with port and rail facilities and the area's economy expanded rapidly. There remain many grand buildings along Hankou's riverfront clearly European in design as a result. The city is perhaps most famous for its pivotal role in the formation of modern China. On October 10, 1911 the Wuchang Uprising, led by Sun Yat-Sen, took place sparking the Xinhai Revolution throughout the nation which resulted in the overthrow of the Qing Dynasty (China's last) and the formation of the Republic of China. The event is commemorated in many place names beginning with "Shouyi", literally "First Revolution", including a public square with an attached museum. In the ensuing chaos of the Republic of China, Wuchang was the capital of a leftist Guomindang government ruled over by Wang Jingwei in direct opposition to Chiang Kai-shek. In 1927, Hanyang, Hankou, and Wuchang were united to form the city of Wuhan. The city fell under siege by the Japanese during WWII and was liberated in 1949. With the opening of China, Wuhan was reopened in 1992 for the first time since the revolution. Today, Wuhan is one of China's largest cities and remains an important center of commerce. While many visitors overlook Wuhan as just another city, beneath its industrial exterior a rewarding tapestry of history and cultural arts awaits. Wuhan is an amalgamation of three smaller cities, Hankou, Hanyang and Wuchang, each separated from the other by a river. Hankou is the business center and it sits to the northwest with the Yangtze River separating it from Wuchang and the Han River separating it from Hanyang. Wuchang is the education center hosting a bewildering variety of universities, institutes and colleges. It is separated from both Hankou and Hanyang by the Yangtze River. Hanyang is the industrial center, separated from Hankou by the Han River and from Wuchang by the Yangtze River. The Number One Yangtze River Bridge, an old, Soviet-era colossus of engineering incorporating both rail and automobile traffic in a dual-layer setup, connects Wuchang with Hanyang. The more graceful Number Two Yangtze River Bridge, currently only open to automobile traffic, connects Wuchang with Hankou to the north. There are two major bridges across the Han River shuttling automobile traffic between Hanyang and Hankou. These two bridges are within sight of each other on the few smog-free days that exist. The Number Three Yangtze River Bridge, connects the outskirts of Wuchang with the outskirts of Hanyang to the distant south. Wuhan has a humid subtropical climate with 4 distinctive seasons and abundant rainfall measuring 1.315mm on average. Winters in the city are cold the average January temperature being 4°C (39°F) and low temperatures around freezing and the high humidity makes it feel much colder. The city is influenced by the freezing winds blowing from Siberia, not to the extent however of the North China Plain. Occasionally, cold waves may occur lowering temperatures to -10°C (14°F) in some cases, while temperatures below -12°C (10°F) are rare. The city does occasionally receive snowfall so it has an average of about 5-10 days of some snow on the ground every winter. The lowest recorded temperature is -18.1°C (-0.5°F). Summers are hot and very humid. The combination of hot daytime temperatures, 32°C (90°F) on average, and very high humidity (77%) makes the heat feel oppressive. During heat waves the city may heat up to 35°C (95°F), so that the highest recorded temperature is 39.6°C (103.2°F). The majority of total precipitation falls during these months, due to the influence of the south-west monsoon. Spring and autumn are pleasant transitional seasons, albeit being very unpredictable. Wuhan is a major city in a central position. It has all the bus, rail, road and air connections you would expect. Wuhan can be accessed easily from Wuhan Tianhe International Airport (WUH)  about an hour outside of the city center. Flights from all major domestic airports are available, including Xian, Beijing, Shanghai, Chengdu, Hong Kong and Taipei. International flights operate from Seoul, Paris, Tokyo, Singapore and Bangkok. Thai AirAsia  recently launched  its daily Bangkok-Wuhan service. The airport can be reached by metro on Line 2, with 7元 getting you anywhere in the city that is on the metro network, including all major train stations. The metro is easy to find (just follow signs for Transport Centre, if the author remembers correctly). Ticket machines have an English option and videos are available on YouTube about how the metro works. The machines require notes less than 20元 when buying singles. Wuhan is a major railway hub, connected by direct trains with most of China's major cities. Overnight express trains (Z series trains) take one from Beijing (¥263), Shanghai, Hangzhou or Ningbo in 9-12 hours. There are also frequent train connections from Guangzhou taking about 12 hours and a bit less frequent trains from Shenzhen. Besides over night trains, there are also day-time high-speed trains (D and G series) which connect Wuhan with Beijing (via Zhengzhou and Shijiazhuang), Xi'an, Shanghai (via Hefei and Nanjing), Guangzhou (via Changsha), Nanchang and Yichang. It takes 4.25–6.15 hours to Shanghai (¥280), 4.5 hours to Beijing (¥520.50), 4.6–5.2 hours to Xi'an (¥454.50) and 3.7–4.5 hours to Guangzhou (¥463.50). The biggest hassle for most train travellers in Wuhan is that there are 3 wide spread train stations serving the three older cities that make up modern Wuhan and until 2009, none of them used Wuhan in their name. Wuhan Railway Station is the newest of the three stations to the east of the city, it is the main north-south high speed train station and only a few conventional trains stop here. Hankou Railway Station is in the north of the city and handles most east-west high speed trains but also many conventional trains. Wuchang Station in the south of the city handles mostly conventional trains. Both Wuchang and Hankou stations handle trains headed to many destinations all across China, making it confusing for travellers as to which station to use or fail to recognise that these stations are even in Wuhan when booking tickets. There are two major long distance bus stations, again in Hankou and Wuchang respectively, which tend to have buses visiting both. You can also reach Wuhan via boats on the Yangtze River, either from downstream centers such as Shanghai and Nanjing or from Chongqing further upstream, via the famous Three Gorges route. Wuhan has a cheap (2元 per journey), efficient, but horribly bewildering bus system in place. The service has vastly improved compared to the past. It is the cheapest way to get around the city. If you have a local to guide you, it can be used to get from place to place with impressive speed (if not comfort or safety). Without a local to guide you, you should better have a very good map and a good grasp of Chinese. Bus stops do not appear to have a timetable as such but rather a breakdown of the route - you simply wait for the next bus as they are very frequent. These route guides indicate where the buses meet up with the metro (a little M symbol) so if you are lost or not near a metro stop find a bus stop and catch a bus that intersects a metro line - then keep your eyes peeled as the buses move incredibly fast! Metro network now consists of five lines, with more lines due to open soon. A single journey can cost anywhere from 2元 to 7元. Announcements and signs are in both Chinese and English. It is a very busy metro network so unless you get on a terminus you must be prepared to be very forceful to obtain a seat. It is advisable to download a metro map app on your phone (as these will be up to date with the most recent metro extensions, whereas image based maps may be incorrect). There are many options available and the author would recommend that you research the different choices based on your travel plans - eg: some apps come with maps of multiple metro plans to avoid the need to download multiple apps. Public transport in Wuhan ends much earlier than is found in many other cities around the world. Buses begin about 6am and end about 10pm depending on the route. The metro, depending on the line and direction, begins around 6am and can end any time between 10.30pm and 11.30pm. Taxis are not hard to find. Taxis are supposed to switch drivers at 5:30pm however often they will appear to do so much earlier. After 4pm, expect half of all taxis to display a sign indicating they are not for hire. In congested areas, especially 1-way streets with no convenient exit, taxi drivers displaying the for hire sign (空车） sometimes reject you if it is inconvenient to them, but they rarely do this. Be aware and plan accordingly if you have to be somewhere on-time. Please also be aware that the lack of adequate taxis in congested areas (WuHan Plaza, for example), people in WuHan are much more aggressive when trying to get a taxi. Expect to race to any car that stops and to hold your ground at the door (for example if you're waiting at the front door, someone will jump in the back). Rates are relatively cheap at 10元 on the flag and with around 70元 getting you between almost any two spots you are likely to want to travel between. It is possible to get higher taxi fares, but usually only because the taxi driver has deliberately taken you on a longer trip (which is, thankfully, not a common occurrence). Airport taxis are the exception. Foreigners in particular are likely to get ripped off by taxi drivers at the airport. They will demand prices starting at 150元 to go anywhere in the city. For reference, going from the airport to the middle of Hanyang costs about 50元 typically. It is advisable to insist on the metre before the taxi starts moving and if the driver refuses, step out, collect your luggage and go back to the taxi stand. Note that this is not a serious problem in the daytime when there is a supervisor at the taxi stand who is an airport employee, rather than a taxi driver himself. One oddity of the taxi system is crossing the bridges. Because of the traffic problems and snarls at the bridges, the city has instituted a system in which half the taxis are not permitted to cross the bridge on half the days. Basically, if the day of the month is odd, odd-numbered taxis are allowed to use the Number One Bridge. If the day of the month is even, even-numbered taxis are allowed to use the Number One Bridge. This system may extend to the Number Two Bridge (this is not yet confirmed) but it does not extend to the Number Three Bridge. In most circumstances, however, it is not advisable to use the Number Three Bridge as it tends to increase the taxi fares dramatically (although it is an interesting ride). The Yangtze River can be crossed by ferry for a very reasonable fee of 1.5元. The ferry runs frequently starting at 7AM and ending at 9PM. It offers by virtue of its unique location some nice views of the city, the Number One Yangtze River Bridge, Yellow Crane Tower, etc. during the day and an interesting nightscape view after dark. Snake Hill Park from the Yellow Crane Tower. Yellow Crane Tower (黄鹤楼 Huanghelou), . The single largest tourist attraction in Wuhan, the tower is a modern construction built on the site of twelve previous incarnations. It is considered one of the four great towers in China. The tower sits atop Snake Hill near the Number One Yangtze River Bridge and affords a commanding view of the Yangtze River as well as the mouth of the Han River where it connects. The view of the city is very impressive, although at times made slightly hazy by smog. On the clearest days, one can see practically the entire city of Wuhan and far up and down the Yangtze River. Entering the park costs ¥80 (as of 12/2010) which gives access to Snake Hill Park, Yellow Crane Tower and the Mao Pavilion (in which many of the poems of Chairman Mao are etched into stone for viewing pleasure). The park as a whole is nicely landscaped with many charming buildings. Of particular interest is the enormous bronze bell located behind Yellow Crane Tower itself as well as a teahouse on the premises which features regular performances of traditional Chu-era music. The performance itself is free, but it is expected that patrons enjoying it order at least a beverage or a small snack. The current tower was completed in the 1980s using modern materials, most notably, concrete is used instead of wood for all supporting members so as to prevent yet another disaster, since the twelve previous towers were all destroyed by fires and war. The ground floor of the tower contains a large entrance hall, two stories tall, with enormous decorative lamps and a giant ceramic fresco displaying the quasi-mythical story of the tower's initial construction. The second story, essentially a balcony around the entrance hall, contains a souvenir shop as well as displays of traditional Chinese paintings and calligraphy. The third story has a residence done up in the very ancient, Chu style modelled after the kinds of sitting rooms used by nobility greeting guests in the ancient period. The fourth story contains another souvenir shop and a set of models displaying the tower in five of its previous incarnations. This latter display shows the fascinating development of an essentially military watchtower into an increasingly residence/tourist-oriented showpiece. The top accessible story has pay telescopes and some nice art displays. Wuhan is famous for its morning xiaochi (literally translated as "small-eats")- a variety of breakfast foods. Hubuxiang （户部巷） in Wuchang is Wuhan's famous breakfast alley where you will find all of Wuhan's famous breakfast dishes. Reganmian (热干面） (literally, "hot dry noodle") is the epitome of Wuhan's breakfast food. It is noodles with peanut sauce, tossed in sesame paste and other seasonings. You will find these noodles for ¥3 from street vendors. Other Wuhan breakfast specialties include mianwo, a type of savory donut; tangbao, small dumpling-buns filled with pork and soup; mibaba, a lightly sweetened pancake made with rice flour; and mijiu tangyuan, a sweet soup of rice wine (fermented from glutinous rice) with rice flour dumplings stuffed with sesame paste and "doupi", rice fried into a cake with tofu skin and some pickled veg. In addition, the area to the north of the 江汉路 (Jianghan Road) subway stop is littered with small roadside stands and stalls during the morning travel rush. From about 7 onwards, the majority of the entrances and alleyways leading into the Jianghan Pedestrian Street (immediately to the north of the subway stop, Exit C) have people selling portable and not-so-portable breakfast foods, including the above-mentioned 热干面 (Reganmian) and about fifteen varieties of handheld pancake. 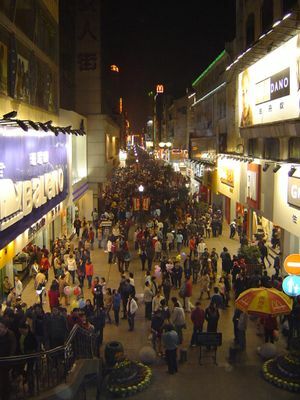 South of Exit B of 江汉路 (Jianghan Road), along 交通路 (Jiaotong Road), there's a fairly large shopping area, under which is another major food "street" frequented by the locals. For entrances, look for small stand-alone buildings with escalators and staircases leading downwards, in between the shopping malls. The most noticeable are a red-colored, half-cylindrical building in the middle of the shopping area and one with a peaked yellow roof along 中山大道 (Zhongshan Blvd). There are a few drinks that are associated with the city. Included in this list is Jingjiu (a healthy alternative to regular wines), Baijiu. If you would like to taste something slightly more low key, there is a local micro-brew called Singo (Xingyinge), that will be the beginning of every good night, at just ¥1.5 per bottle. Wuhan University(武汉大学 Wǔ-hàn-Dà-xué), It is regarded as one of the top ten universities in China, and its history dates back to 1893, making it one of China's oldest institutions of higher learning. It was also one of the first modern "national universities" in post-dynastic China. It is located in Hubei province's capital, Wuhan, known as "the nine provinces' leading thoroughfare". South-Central University for Nationalities(中南民族大学 Zhōng-nán-mín-zú-Dà-xué). It is a national university located in Hubei province's capital Wuhan, directly under the State Ethnic Affairs Commission of PRC. It is a comprehensive university founded in 1951 and the former name was South Central College for Nationalities(Chinese: 中南民族学院). In March 2002, the school adopted the current name. As one of the 6 national higher education institutes for ethnic groups in China, SCUN is committed to the innovation in higher education for ethnic groups, and thus has achieved a rapid and comprehensive development. Everyone in SCUN, led by a wise and united leadership is making great effort for the comprehensive development of the school— to improve its teaching and learning conditions, enhance its education quality, construct a harmonious campus and ultimately make SCUN an outstanding university for ethnic groups with its own distinguishing features. SCUN is well on its way to a better future. There are two train stations in Wuchang (Wuchang station and Wuhan station, the latter for high speed trains) and one in Hankou. There are also long-distance bus stations; one in Hankou, and near the Wuchang train station. This page was last edited on 21 March 2019, at 11:19.